We are a home based family run business and the nature of our work often keeps us in the field. Email communication is preferred as it provides us a logged reference to your inquiries and requests and allows us to work more efficiently. We are available to answer questions promptly via email by submitting your inquiry below. I'm interested in home - Dolphin Watch. Special discounts on rentals, area information, news and events. Click here to sign up to receive our monthly email newsletters. Delightful images of Alligator Point nature from black bears to baby alligators. Click here to visit Stephanie's nature photo gallery. 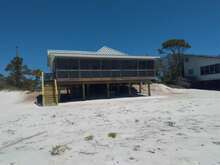 View our inventory of pet friendly vacation homes on Alligator Point.